About Us – Campaign for Regional Community Public Banks in Ireland — Banking in the Public Interest! The PBA, founded by the Public Banking Forum of Ireland in 2016. The Public Banking Alliance and its 2016 Election Campaign came about as a result of a negative response from the Minister for Finance to an appeal from the Public Banking Forum of Ireland (PBFI) to the Minster to introduce or support the introduction of a Public Banking System to Ireland. The Public Banking Alliance is made up of 2016 General Election Candidates who support the Public Banking initiative, i.e. to introduce a comprehensive Regional Community Banking System to Ireland. In Ireland Small and Medium Size Businesses (SME’s) provide 70% of all our jobs. The Minster saw no contradiction in telling us that he was fully satisfied borrowing money from a German Public Bank, the KfW, channeling it through the Strategic Investment Corporation of Ireland and on-wards to the Irish Commercial Banks, for them to on-lend to Irish SME’s. The interest being paid to the KfW probably would setup a Public Bank here. The Current situation with the Commercial Banks is that your savings are not safe in them; depositors are classed as unsecured lenders to the bank. Recently in the Cyprus Bail-in the banks took 47.5% of depositor’s money over €100k. The PBFI saw no alternative but to work to put public representatives in the Dáil who support the Regional Public Banking project and will work to introduce a Public Banking System that will properly support the crucial SME sector and the regions. We invite all to join and support this vital project. 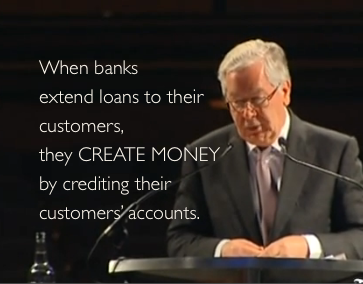 This control and power should not be in the hands of a few CEOs of the private commercial banks!